7627058 LEGO Kids Star Wars Luke R2D2 is a watch developed by Zappos for LEGO in 2009. It is a primarily blue watch, with an R2-D2 Minifigure design. It also comes with an R2-D2 minifigure. 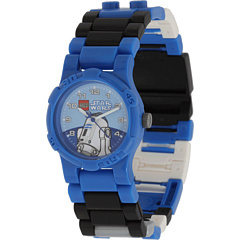 Take the force with you wherever you go with this fun LEGO® Kids watch. Interchangeable components allow for a custom look. Cool R2D2 graphics decorate the face. Star Wars™ R2D2 Minifigure™ included. Face: 26mm W x 26mm H.
© 2009 Lucasfilm Ltd. & TM. All rights reserved. Facts about "7627058 LEGO Kids Star Wars Luke R2D2"
This page was last edited on 9 January 2016, at 21:40.